So you can perhaps re-enable sync with your server. You don't want to delete any events that are safely stored on the server. 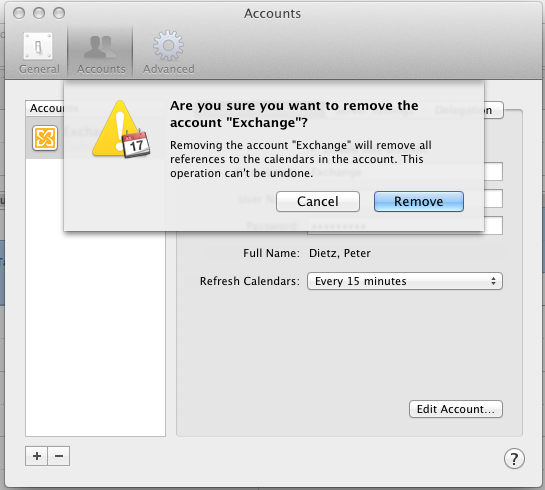 So go to iCal -- Preferences -- Accounts, and then delete your server account (Exchange in my case). Step 2 - Realize that there's no Delete All button in the iCal preferences or anywhere, and start Googling for advice, and hopefully arrive here at this blog post. 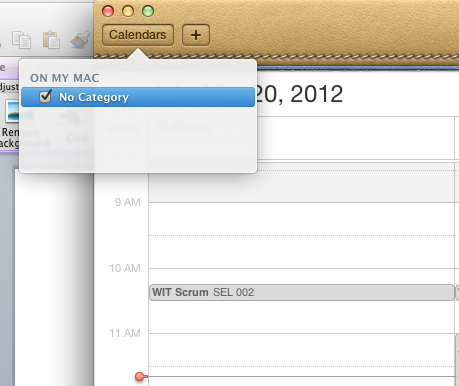 Step 3 - Go to the Calendars button, create a new Calendar, and delete your existing Calendar. 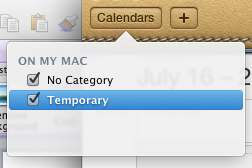 After your server account is deleted, the Calendars button should have a default Calendar called "No Category". You can't delete that if thats the only calendar that exists, so create a new calendar, by Right Clicking, and adding a new calendar. After the new calendar is created (I called it Temporary), you can delete the old calendar that has the offline / synced events that you wish to delete. 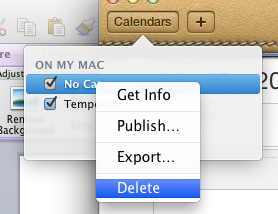 To delete your old / cached information, right click on "No Category" and select Delete. And accept the confirmation to actually delete everything. Warning: If that was your Calendar that had all your information, it will delete it. Please ensure that you've followed the above advice before clicking Delete (for reals), that you've removed your sync connection to any of your server based calendar systems (such as Exchange), so that you don't actually delete your Calendar events that you perhaps share with your colleagues. This is useful and to the point. Thanks. Your a lifesaver. This is typical MAC. Make things so dummed down it is a pain to clean up their mess. Thanks so much for your help here! Thank you for this. I chuckled at Step 2. So true.